Me: You've written several books for adults (under the pen name Alayna Williams). What made you decide to write for teens? How is it different than writing for an older audience? thought about whether it would work best in the contemporary fantasy or the horror market. And to my surprise…she said I’d written a YA novel. So I re-read the book, and it began to come together for me. I never explicitly gave Katie an age. Katie was dealing with many of the issues that young adults deal with: questioning authority, creating her own identity, and developing her own moral compass. It was a happy serendipity. I’d wandered into new territory for me, territory that’s challenging and also really exhilarating. Me: What made you switch from the urban fantasy genre to horror? And, why vampires? LB: Most of the fantasy I’ve written has something of a dark side, so it was a short leap to horror for me. I love writing about things that go bump in the night. Vampires are admittedly a hard sell right now. But I wanted a supernatural adversary for Katie that would challenge her faith and have some historical aversion to religious symbols and holy ground. Old school vampires are that, and if I avoided using them because of market saturation, I would not have been doing a service to the story. Me: In THE HALLOWED ONES and its sequel, THE OUTSIDE, you write about Amish people living in a secluded religious community. Do you have any experience with the Amish? What kind of research did you have to do in order to get all the details right? LB: I spent some time visiting the Amish settlement near where I live. I also did a good deal of reading…there are a lot of great books out there that look at the Plain way of life from a sociological perspective. National Geographic has also done a number of very good documentaries about the Amish. Many of the ideas were very foreign to me. For example, the Amish do not wish to be connected to the outside world, so power lines, phone lines, and electricity aren’t used. That kind of voluntary isolation is fascinating to me. The only parallel I can draw in my own life is when storms came through our area and we were without phone, cable, electricity, and internet for a week. It was very still and very peaceful. I’m acutely conscious that I can’t know or understand everything about the Amish, never having lived in an Amish community. But I learned enough to develop an immense respect for the Amish way of life. Me: What intrigued you about this kind of setting? How does it make your vampire story unique? LB: I grew up not too far from a large Amish settlement - my parents would take me to visit on weekends when I was a little girl. I really admired the self-sufficiency of the Amish, how they remained separate from the modern world and kept very close to the earth for survival. When I was creating this series, I thought that they’d be uniquely-equipped to survive a large-scale disaster. The isolation became some interesting material to work with, as they know that something terrible has happened to the outside world in my story, but they don’t know what it is. Me: You don't see a lot of YA books (especially horror novels) about faith and religion, yet this is actually the thing that intrigued me most about the story. Granted I'm not a teen, but still ... were you nervous about how a more philosophical/spiritual story would be received by your target audience? And, how do you think teens will relate to Katie? LB: Yes – I was nervous about how it would be received. Katie is unlike any of the heroines I’ve written before, as her religion is an integral part of her life. I didn’t want to minimize that or be untrue to who she is as a character. Katie’s story is very much a coming of age story as she figures out what she believes and why. Katie goes through many trials as she grows up, and I wanted to explore the tension of her becoming an individual from a very collectivist society. I think that’s something we all can relate to – becoming our own person, distinct from our family and the people around us. We ultimately have to make our own decisions and decide where the good of the many outweighs our own personal good. Me: Speaking of Katie, she's a very relatable, unique character. How did you make her feel SO real? LB: Thank you! I wanted her to be believable in her reactions and the way she tries to make sense of the world. She always approaches her decisions with compassion, which I think is an admirable trait. She’s much more compassionate and much stronger than I could ever dream of being, but she questions herself…which is something that I believe all thinking people do. Me: I love the question that lies at the heart of THE HALLOWED ONES and THE OUTSIDE -- If God doesn't exist, does it really matter what we do? Katie obviously thinks it does, but how would YOU answer this question for yourself? LB: I think how we act is what matters, bottom line. What we do has great impact in the world, and I think it’s important that we act with integrity and compassion, regardless of what might be waiting for us in the afterlife. Me: THE OUTSIDE ties everything in Katie's world up in a very satisfactory way, BUT I already miss the characters. Will we be seeing more of them in future books? LB: No plans just yet for further adventures! I never rule anything out, but I think that Katie has come full circle in her story. 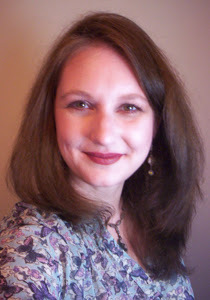 LB: I have another YA project and another contemporary fantasy project in the works…I can’t say much about them now, but stay tuned for details! Me: Since today is Halloween, I have to ask: do you love the holiday, hate it or fall somewhere in the middle? What was the best costume you ever wore? Or the biggest Halloween scare you ever experienced? LB: I love Halloween. When I was a kid, I think I was Wonder Woman for five consecutive Halloweens. I loved running up and down the street with my friends, clutching a sack of candy. What’s not to love? Today, I just pass out the candy (often in costume). We have a giant inflatable black cat that we set up on our porch for Trick or Treat night, and the neighborhood kids really enjoy him. 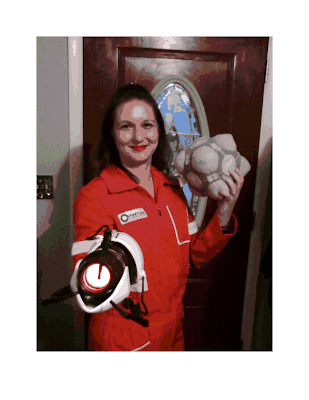 Here’s a picture of me last year, dressed as Chell from the video game Portal. I don’t know what this year’s costume is going to be, but I’m sure we’ll have fun! Me: Thanks so much for visiting BBB today, Laura! Sounds like a fascinating book. I love the Amish, and I am totally intrigued by the idea of combing faith and horror. It reminds me of one of my favorite movies, Brigham City, a Richard Dutcher film. I'll have to read The Hallowed Ones. I will have to add that film to my "to watch" list! Thanks for the suggestion! Wow. She sounds very interesting. Thank you for publishing her interview. I really enjoyed reading it.